Enjoyable Halloween weekend read, not as creepy as I expected but perfectly suited to a younger YA audience. The book uses real photographs from the period setting to great effect throughout, though I do wonder to what extent the characters were shaped by the photos versus the characters shaping the photo choices. I found the plot and world development engaging, but the weak characterization of all the characters we weren’t ‘peculiar’ let the book down a bit for me. Miss Peregrine’s home for Peculiar Children has two settings in time – the 1940s and the present day- but only a single plot. The main character, Jason, has grown up listening to his grandfather’s wonderful, fantastical tales of a Home for peculiar children that he was sent to during WWII and the weird and wonderful abilities of the children he lived with. Jason takes these stories as truth when he is young, but eventually grows to believe they are fantasy. Everything changes when Jason is given a reason to find out what his grandfather was really talking about, and so the story unfolds. I really enjoyed the world building and historical elements in this book. I loved how the different ‘worlds’ as Jason experiences them fit together quite neatly, each having a distinctive flavour, a different tint of darkness. The book draws on events of WWII, and if you aren’t sure if historical fiction is for you this is a light introduction to blending true historical details with fictional characters and plot elements. I felt that the author evoked really well the looming fear and disconnected experience of war for those who are living through it as civilians, rather than fighting it as soldiers. Despite the dark subject matter I found this book to more childish than I expected. I would be quite comfortable recommending it to a confident reader of 12 or 13, or a slightly less confident reader of 14. The main character, Jason, is 16 but I felt his character was written as though he was younger than that. It felt strange that a boy of 16 would try to convince people that he had seen something strange, rather than clamming up or writing it off, at least initially. In addition I felt Jason’s parents were poorly written. His mother is a paper cut-out of stereotypical wealthy heiress, and his father a tragic ‘no-hoper’ emasculated by his wife, and jealous of his son’s relationship with his father (Jason’s grandfather). 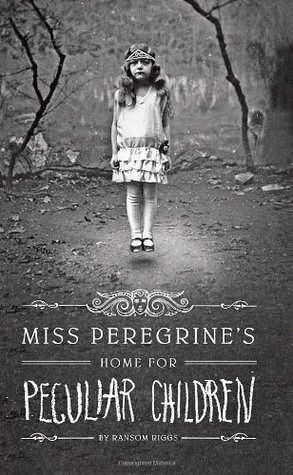 I found the first book in the Miss Peregrine’s trilogy very enjoyable, but I am not sure yet if I will be continuing with the other books. The ending left plenty open for exploration but I don’t have any emotional investment in the characters or the plot, and I would be quite content to leave Jason where he was, on the cusp of coming to terms with himself, his family and his future.